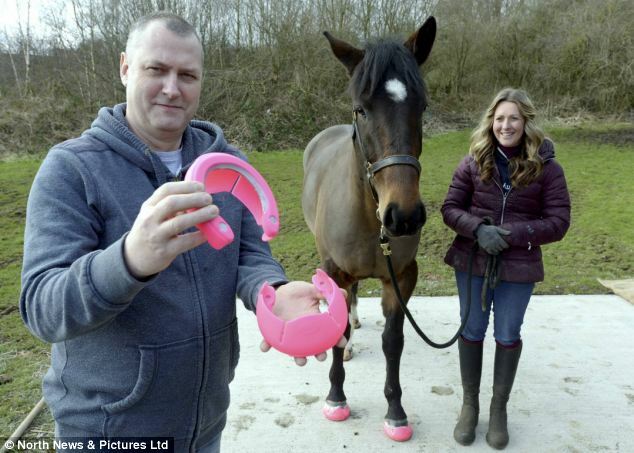 A revolutionary slip-on plastic coated hoof that doubles as an equine fashion accessory could spell the end for nailing on horseshoes. An equestrian designer came up with the 'GluShu', which uses a traditional metal horseshoe that is coated in a durable thick plastic covering and glued to the animal's foot rather than nailed. The coating offers the horse more cushioning and offers an easier alternative to the traditional method of fitting shoes. But not only are they easier to fit and more comfortable for the horse, the shoes could become something of an equine fashion accessory as they come in a variety colours including neon pink and grey and look like the popular plastic sandals Crocs. The new shoes were designed by John Wright with the help of GB Olympic equestrian team farrier Jeffrey Newnham. Reparixin: The Future of Laminitis Treatment? How accurate is thermography of horses’ legs?